Baltimore's New Police Commissioner Would Be City's 5th In 4 Years The Baltimore Police Department's reputation is in tatters with the community after a series of scandals ranging from officer misconduct to corruption. 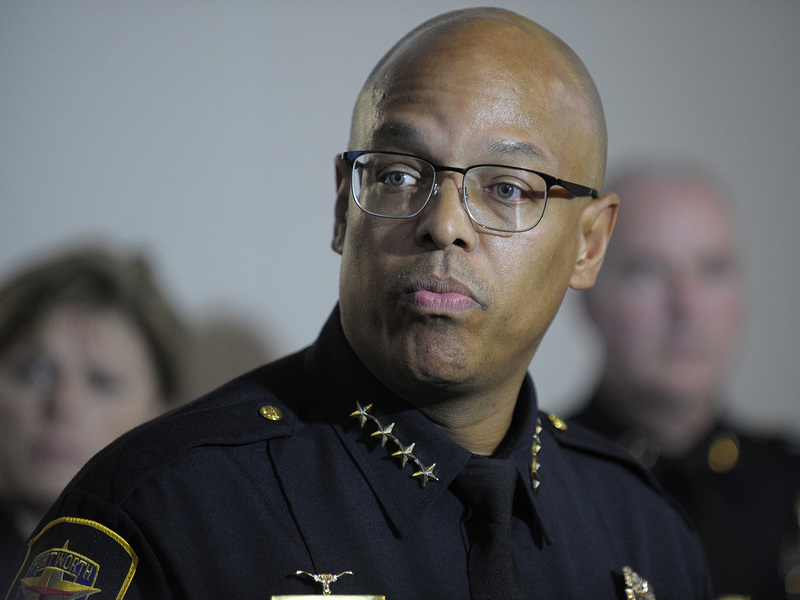 Joel Fitzgerald is currently the chief of police for the Fort Worth Police Department, a position he's held since 2015. He is the mayor's leading candidate to become the top cop in Baltimore. He would take up the reins at a department that's been grappling for years on how to quell a stubborn gun violence epidemic. Moreover, the department's reputation is in tatters with the community it serves after an unrelenting series of scandals ranging from officer misconduct to corruption to tensions still frayed after civil unrest in 2015. Pugh's nomination of Fitzgerald also sets into motion what many believe is an extraordinary vetting process by the Baltimore City Council. Beginning on Sunday, a delegation of council members will travel to Fort Worth to hold interviews and meetings with business owners, clergy, elected officials and other residents to get a sense of Fitzgerald's interactions and standing with the community. The council's findings from the Fort Worth trip will be compiled and released to the public sometime before the end of the year. After the start of the new year, the city will hold a pair of hearings, with at least one of them open to the public, setting the stage for a high-stakes confirmation vote at the end of the January. Members of the city council have called for more information from the mayor on how her office went about vetting Fitzgerald. They have also called for the release of a background investigation the mayor's office had compiled by an outside firm. Councilman Brandon Scott, who has been one of the most vocal members calling for the release of the background investigation on Fitzgerald, said not having the report in hand had no bearing on his making the trip to Texas this weekend. The mayor's selection was whittled from 51 candidates to one, Fitzgerald. He was the second choice of the panel of police executives Pugh had advising her in the search, according the The Baltimore Sun. According to Pugh's press secretary James Bentley, Fitzgerald will have meetings of his own with members of the Baltimore community. "As the Commissioner-designate for the Baltimore Police Department, [he] will be meeting with a wide range of community stakeholder groups in Baltimore prior to the City Council hearings, likely to occur mid-January. Until that time, he continues as the Police Chief of Fort Worth, Texas," Bentley said. City leaders and residents alike hope that if Fitzgerald is confirmed, he'll bring some much needed stability at the top of the police department. Interim Police Commissioner Gary Tuggle who has been serving in the position for months, withdrew his name from consideration for the permanent position in October, according to the Sun. Tuggle was elevated to the post in May. Darryl De Sousa had resigned as commissioner after federal prosecutors charged him for failing to file three years of federal tax returns, beginning in 2013. De Sousa, a 30-year veteran of the department, was in the top spot for only a few months after replacing former commissioner Kevin Davis. Davis was fired in January after the mayor grew impatient with the department's inability to reduce crime in the city. Davis took over as city's top cop following the ouster of Anthony Batts, who was relieved of duties in the aftermath of the 2015 Baltimore riots following the death of Freddie Gray. Gray was a black man who died from injuries suffered while in police custody. Aside from leadership turnover, Fitzgerald would also inherit a department trying to overcome scandal. In February a pair of Baltimore detectives were convicted by a federal jury of racketeering and other crimes related to the city's controversial and now-defunct Gun Trace Task Force. And in 2017, the city of Baltimore and the Justice Department entered into a court-ordered consent decree, which came about after the Department of Justice report found police there disproportionately target African-Americans for stops and arrests.